The USS Spruance, DDG-111, departs Bath Iron Works Thursday and makes its way down the Kennebec River to the sea. 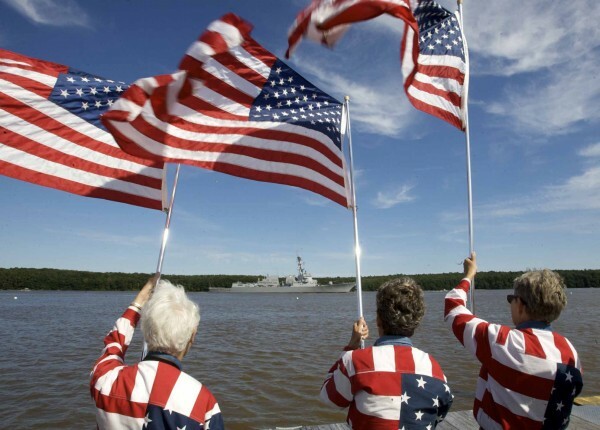 JoAnn Miller, left, Carmen Footer, center, and Elaine Greene â better known as the Freeport Flag Ladies â wave Old Glory from a dock at the Maine Maritime Museum in Bath as the USS Spruance departs Bath Iron Works and slips down the Kennebec River to the sea Thursday. 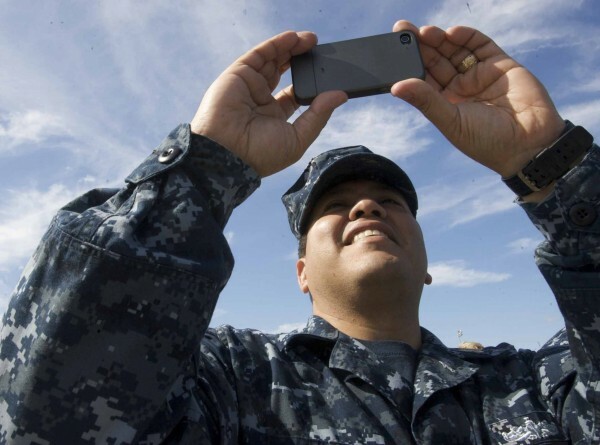 Jesse Garcia, quartermaster chief of the unfinished destroyer Michael Murphy, takes a video with his phone as the USS Spruance departs Bath Iron Works and makes its way down the Kennebec River to the sea Thursday. 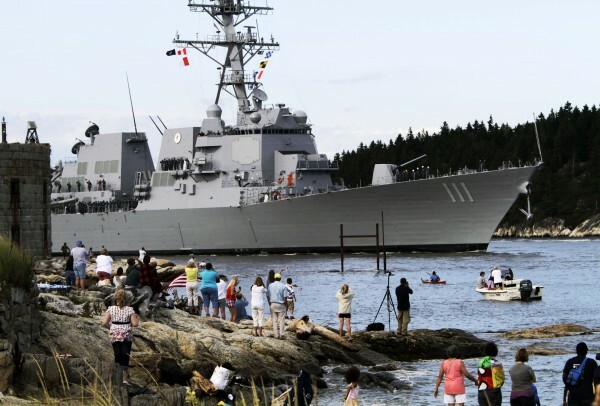 People greet the US Navy Destroyer, Spruance, as it passes Popham Beach in Phippsburg, Maine on its way from Bath Iron Works in Bath, Maine to her commissioning at Key West, Fla. in late October, on Thursday, Sept. 1, 2011. 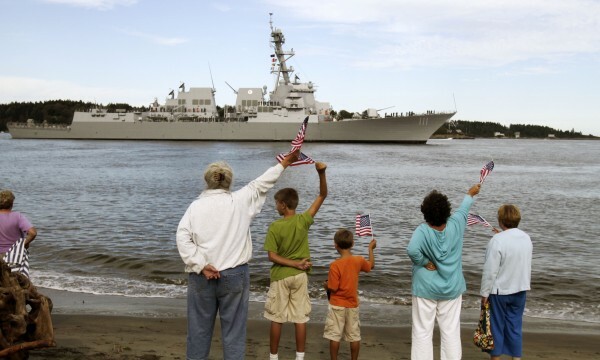 People greet the US Navy Destroyer, Spruance, as it passes Fort Popham in Phippsburg, Maine on its way from Bath Iron Works in Bath, Maine to her commissioning at Key West, Florida in late October, on Thursday, Sept. 1, 2011. 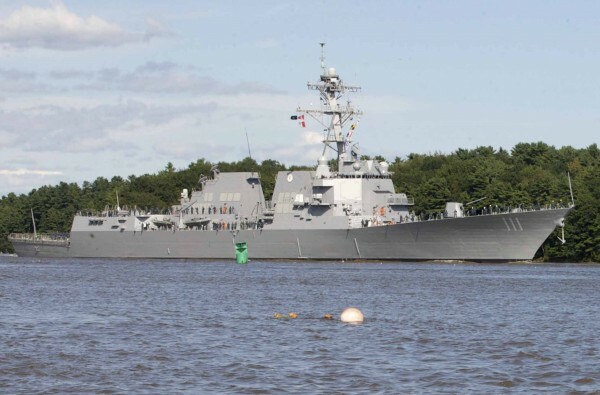 BATH, Maine — The newest Arleigh Burke-class guided missile destroyer built at Bath Iron Works cruised down the Kennebec River on Thursday to fanfare that has been uncommon in recent memory. It has been many years since BIW installed a land-level transfer facility and dry dock that pushed into history the days when the ships slid down slanted ways from the shipyard to the water. While BIW still holds christening ceremonies for every ship, several people at a first-of-its-kind ceremony Thursday at Maine Maritime Museum remarked that they miss the drama of 500-foot ships hitting water for the first time. With the roar of a cannon salute, patriotic music from the Bath Municipal Band and a gathering of dignitaries, Thursday’s event gave nearly 200 attendees the chance to send off the USS Spruance, which will join the ranks of the most technologically advanced guided missile destroyers in the world. Joe Grace of Bath, who retired from a career in the Navy in 1971 — he was based at Brunswick Naval Air Station at the time — said he has been to every BIW ship send-off in the past 40 years. “It’s just for the thrill of it, seeing a new ship setting off for the world,” said Grace, who makes a hobby of watching news clips about BIW-built ships in operations around the world. According to Ed Kenyon, BIW’s DDG-51 program manager, the Spruance is the 33rd Arleigh Burke built in Bath. It is bound for its commissioning ceremony this October in Key West, Fla., and will then be based out of San Diego, Calif. That means it is likely to serve in places such as the Indian Ocean and the Persian Gulf. It’s possible that the Spruance is the second-to-last of its kind to be built in Bath. The next ship in the series is approximately 45 percent complete, said Kenyon, and floats alongside BIW’s docks. The first of an even more advanced class of ship, the DDG-1000 Zumwalt-class destroyers, are in the early stages of construction. However, as the Bangor Daily News reported Thursday, the Pentagon is considering building more Arleigh Burkes and selling them to Saudi Arabia. Though those negotiations are in the very early stages, Kenyon said the deal could lead to new work for BIW, which has struggled with fluctuations in its workload for years. Jason Morin, director of public programs for Maine Maritime Museum, which is located just south of BIW on the shore of the Kennebec River, said Thursday’s send-off ceremony fits well with the museum’s mission of preserving Maine’s maritime heritage — even on the days when history is being made in real time. Attendees on Thursday afternoon were given free admission to the museum, which includes a marquee display that chronicles BIW’s story. The activities of Bath Iron Works are not without critics. To accommodate the Navy destroyers making their way from Bath to the sea, the Army Corps of Engineers periodically dredges material from the river bottom. The latest round of dredging was performed earlier this month. Steve Hinchman is a Bath-based attorney who represented a coalition of fishermen, shellfish harvesters and other locals who oppose the dredging for environmental reasons. The coalition’s appeal for the dredging to be downsized was rejected in July. Hinchman said this summer’s dredging was the largest in terms of volume in 22 years and the first time it has ever been done in the summer months. Samantha DePoy-Warren, a spokeswoman for the Maine Department of Environmental Protection, said in an email statement that the dredging was carried out this summer with minimal impact. For some attendees of Thursday’s send-off, it was a chance to show some patriotism. Elaine Greene of Freeport is a member of a group called the Freeport Flag Ladies, members of which have donned red, white and blue clothing and rallied on Main Street in Freeport every Tuesday for the past 10 years. Greene said her group’s mission is about patriotism, not politics. Twenty of the sailors from the Spruance, including its commanding officer, joined the Flag Ladies recently and invited them to Thursday’s event.